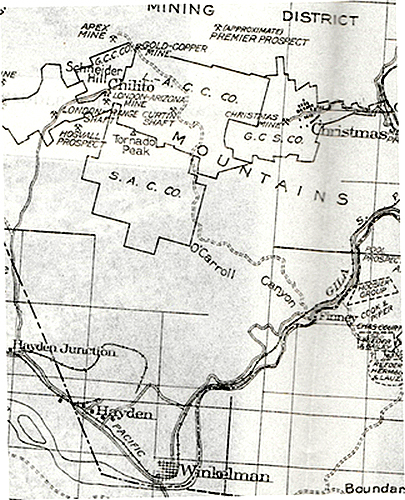 This map from the 1925 USGS Bulletin "Ore Deposits of the Saddle Mountain and Banner Mining Districts, Arizona" shows the O'Carroll Canyon Road located a few miles north of the town of Winkelman in central Arizona. 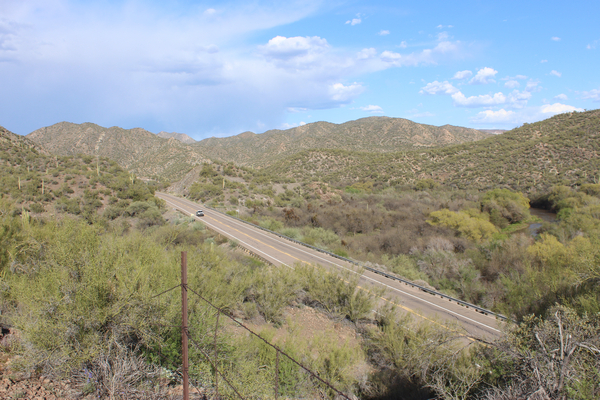 Originally a wagon road, it extended about 5 miles to the southeast from the Apex Mine down to the old Globe to Winkelman Highway and the Arizona Eastern Railroad at Finney. O'Carroll canyon was named for Dan O'Carroll, a very successful prospector and claims owner who was active in the area in the early 1900's. 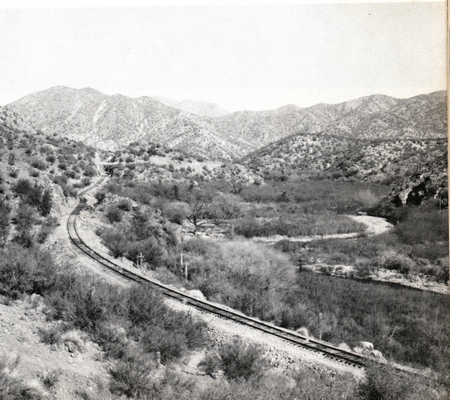 The Arizona Eastern Railroad remained intact until 1960 or so. In this photo, the car bridge over the tracks near Finney can be seen in the distance. After the tracks were removed, the state highway was relocated onto the old railroad bed. The O'Carroll Canyon Road can be accessed through a gate in the Highway 77 fence. A right turn leads to an old bridge crossing over the O'Carroll drainage. The wash is not very canyon like at this location. I engaged the 4WD in my truck at the bridge and I don't believe that the speedometer needle ever registered much above the peg for the duration of the trip. It was a very rocky ride! In a few miles, it became apparent why the name of the drainage is O'Carroll Canyon and not just O'Carroll Wash. I do not know the story of the vehicle seen in the bottom of the gorge. Did it come off the canyon rim? 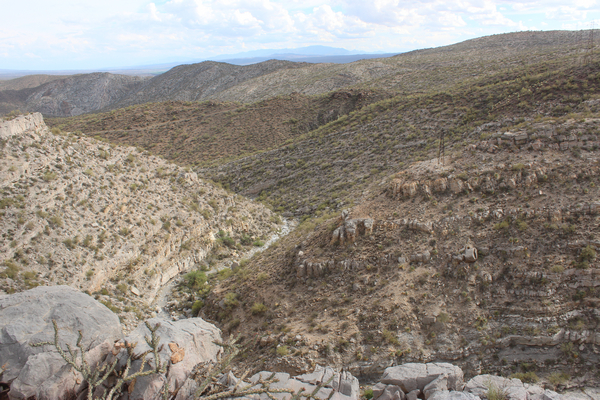 From the Gila River it is a 5 mile climb up to the crest of the mountain range. The elevation change is pretty dramatic. The views back to the southeast are great. The prominent landmark in this photo is Saddle Mountain. 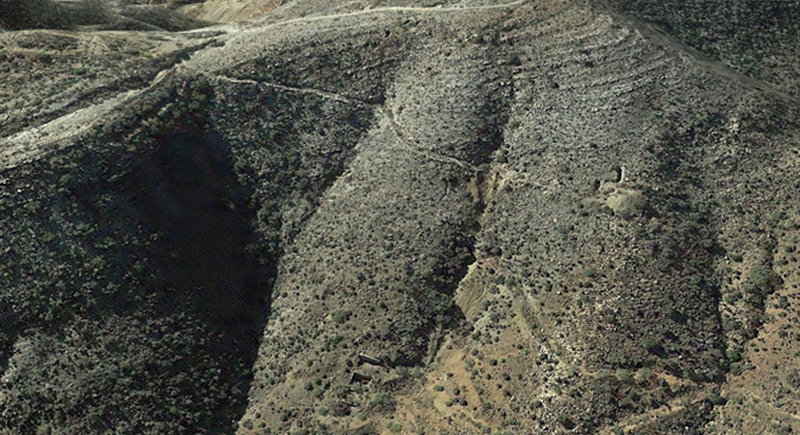 These mine dumps to the west of the road are the waste materials produced from the Curtin Shaft. In 1925, the shaft was reported to be at a depth of 325'. Approximately 1000 tons of lead and 50 tons of zinc had been shipped. Other than a few bits of wood and old sheet iron, not much remains of this mining operation today. 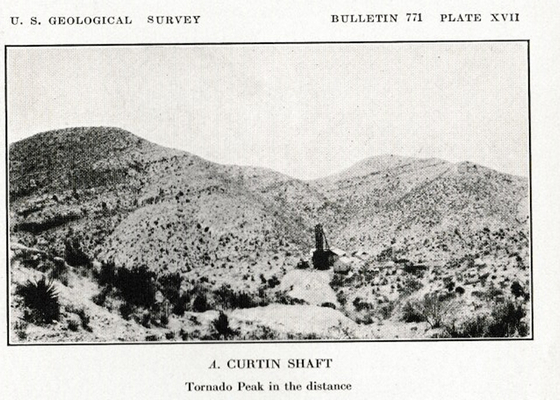 In the 1925 USGS bulletin noted above, this photo of the Curtin Shaft appears. From the differences in the dumps between the two photos it appears that work continued at the site after 1925. Nearby are the remains of this old dugout cabin. It is interesting how the tree, with some modification, was incorporated into its construction. In 1925, the O'Carroll Canyon Road probably stood alone. Today many exploration roads criss-cross the area. It is the OC Road that follows along the Dripping Springs crest. There are several shelf sections at lower elevations. But here, the view down is a bit more exciting. 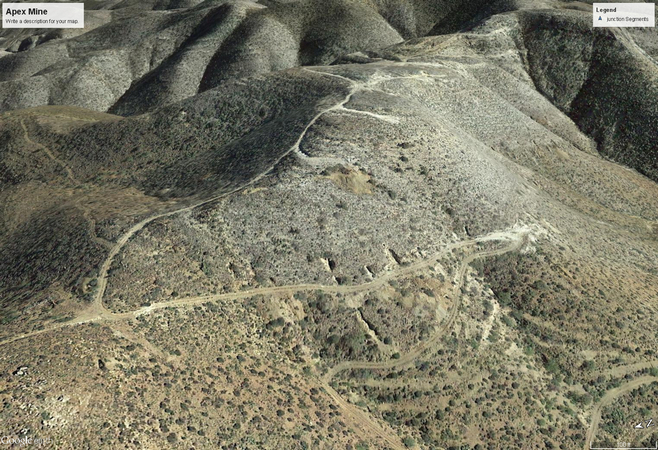 The old Gold-Copper Mines Company site is on a spur road just off the mountain crest to the north. There were several tunnels and a mill. This Google Earth view shows the layout of the site. It took some effort to construct the spur road. Extensive rock work had to be done to contain the many yards of fill needed to build up the road bed. This is a summary of the property as reported in the 1925 bulletin. " The deposit was located about 1914....A mill was completed in the fall of 1921....when visited in 1922, the property was idle. The mine is developed by several tunnels one above the other. At the mouth of the lowest is the mill, which is equipped with amalgamation plates, two concentrating tables, and, below these, cyanide tanks. It is reported to have been in operation 11 days and to have treated 23 tons of ore. On the ridge above the mine are several houses...."
I peeked into each of the upper level tunnels. Only one appeared to have been fully developed. 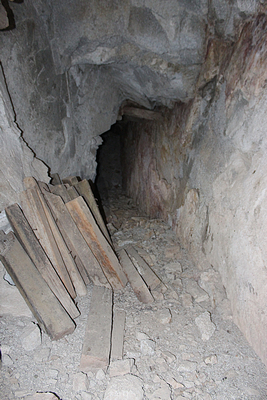 Openings in the floor of that tunnel that were used to chute the ore to a lower level prevented further entry. The lowest tunnel served to haul ore out of the mine. Broken rock falling from above was directed through wooden chutes to waiting mine cars. The mill was constructed in three levels. 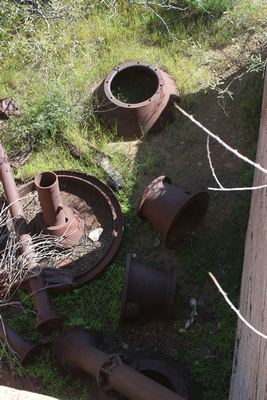 This is a view of some of the machinery that still remains at the site. Perhaps the most interesting piece of equipment is this Roller Quartz Mill that was used to grind gold bearing quartz ore. 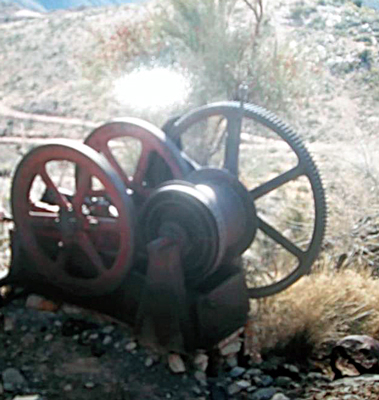 Invented in the late 1800's, this machine replaced the stamp mills used at many mining operations. 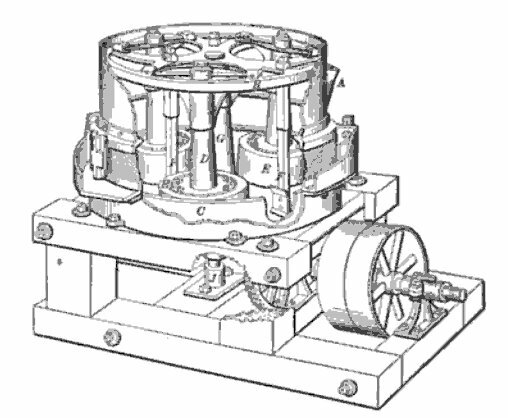 As the mill rotated, roller plates(E) attached to swinging arms(D) would grind the ore against the side of the mill(C). Mercury placed in the bottom pan would attract the gold. 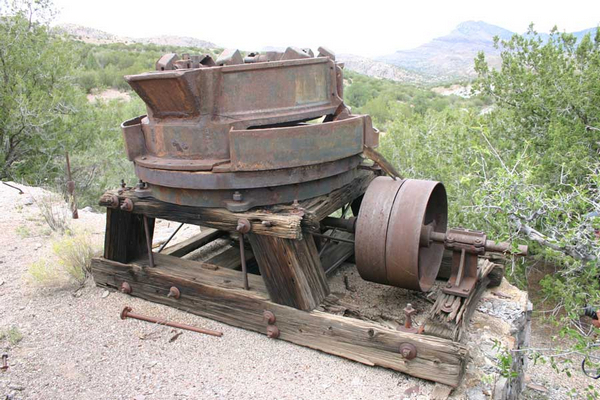 The roller mill was usually mounted on heavy wooden timbers. This is a view of one of the arms and roller plates. The mechanical parts of the old mill seem to be all there. The mill was manufactured by the United Iron Works Company in Oakland California. Nothing wooden remains of the old mill. Was the lumber salvaged to be used elsewhere or could there have been a fire? The photo below shows how the roller mills were set-up. 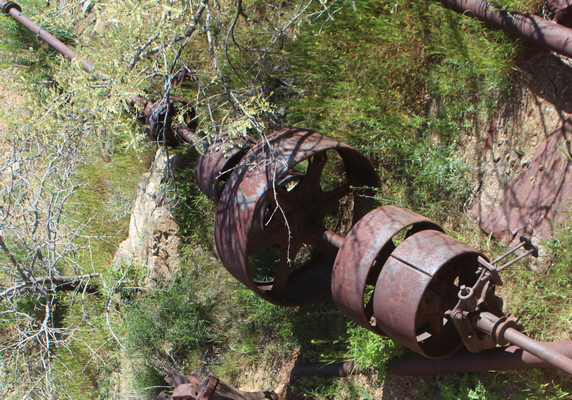 This one is at an old mine site in eastern Arizona. The roller mill is not mentioned in the 1925 USGS bulletin. Did it come along later in the life of the old mine? The mill would have required a fair amount of water in its operation. I wonder what that source was? When I was at this mill in 2006, the power distribution shaft was propped up against one of the mill walls. Today, it is on the ground. I do not know what the other pieces of old iron were used for. Based on the description of the property in the USGS bulletin, I am guessing that this tank is one of the cyanide tanks. Just beyond the Gold Copper Mines Company mine a short distance to the northwest was the Apex Mine at an elevation of 4300'. 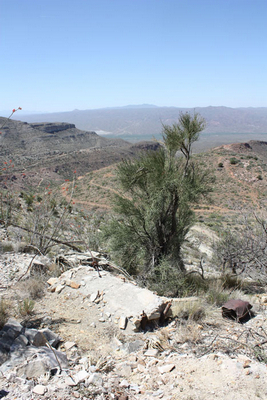 In the 1920's that mine site was at the end of the O"Carroll Canyon road. This Google Earth View shows the site as it appears today. The 1925 USGS bulletin states that: "The deposit was discovered about.....1914....estimated that $10,000 to $20,000 worth of gold ore has been shipped to smelters, besides an unknown quantity of high-grade gold ore, some of which is reported to have contained as much as 70 per cent gold. Property--The principal opening is a tunnel over 300 feet long from which stoping has been done laterally and upward. A shaft extends from the surface..... A number of other tunnels and shafts have been driven. 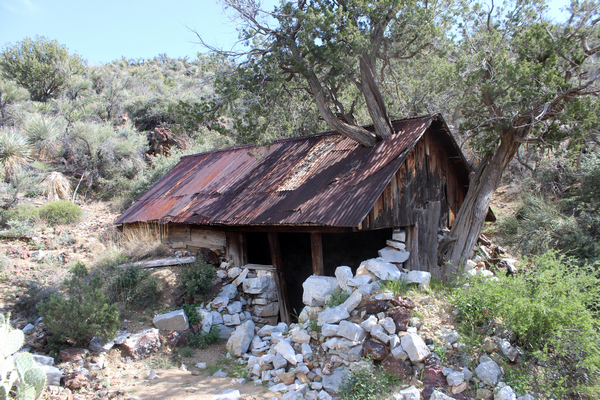 The property includes a small mill, now out of repair, built about 1901, and a dwelling house.....the ore body here is largely worked out except for pillars...."
Today, the remains of a collapsed mine bulding is about all that remains on the surface. A few years ago, an engine/winch combination was in place on its concrete base. The concrete base is still there. The tunnels looked too unstable for me to do any more than to look in from the entrances. The Premier Prospects shown on the USGS map were never associated with the O'Carroll Canyon Road. I don't believe that there ever were any roads down from the Dripping Springs crest to these old operations. Access would have been up from the Dripping Springs Valley. With so much private property down in the valley to try and negotiate through I found it more convenient to hike down from the crest road. It is a steep and strenuous hike! I had been there in 2006, but decided that I would return for another look. Any route taken to the mine must bypass the massive cliffs that are directly above the mine site. The USGS bulletin does not have much to say about this locality. On modern maps, the mine is identified as Santa Monica Camp. Under that name, other references state that $70,000 worth of gold had been reported to have been mined. No date was provided. This view across one of the shafts is into the Dripping Springs Valley. Possible access roads can be seen crossing the foothills. The Mescal Mountains are in the distance. Several adits at different levels are on a nearby hillside. As up at the Apex Mine, conditions at the entrance portals looked too unstable for me to do more than just poke my head inside. There was one disappointment in returning to this old mine. In 2006, there had been an interesting old engine sitting in front of one of the tunnels. It is no longer there. I did see something different on this most recent trip that I somehow had missed on the previous visit. It is an old ore chute/slide of more than 100' in length. The chute is anchored to the hillside with wooden stakes and a steel cable.